As parents, carers or grandparents you have a choice - and the right - to offer your child the best education available. Catholic schools offer a unique educational experience which forms the child or young person as a person of integrity, compassion, faith and wisdom. Catholic schools also work closely with their local parish to enhance a student’s capacity to make sense of their world, to make judgements and to recognise the uniqueness of others within a faith community. Each school has a supportive community of teachers, parents, carers, P&F committees, clergy, parishioners and support staff who work together to focus on students; encouraging success, promoting discipline, supporting creativity and instilling compassion. This means that Catholic schools do not just teach religious studies, they seek to develop spirit, mind, body and character and cultivate Gospel values that support lives filled with joy, endeavour and hope in the future. Each Catholic school has a commitment to focusing on each individual student’s ability, offering a unique array of educational, creative, sporting and formation opportunities for students. Finally, Catholic schools offer peace of mind to parents; knowing they’ve made the right choice and the best investment for their child’s future. It is because of this and the many opportunities available to students, that we believe choosing a Catholic education is the right choice to make. WHY DO STUDENTS AND PARENTS CHOOSE ST BENEDICT’S? St Benedict’s is a very strong community of students, parents, teachers, parishioners and friends. There is a wonderful sense of belonging that permeates the school, creating a family-like atmosphere where everyone is welcome and valued. We pledge to offer our students quality, holistic education in this nurturing learning environment. While valuing the community within the school, St Benedict's members also value the wider community and work to forge mutually advantageous relationships within it. Participation in senior citizen’s events, program of visitation to the local aged care facility and hospital, as well as active participation in community commemorative services and celebrations, ensures students develop a sense of belonging to and responsibility for their local community as citizens. At St Benedict’s our committed staff strives to nurture the development of students and assist them to reach their full potential. Every member of staff really knows each student. There is a tremendous feeling of belonging in this school. The students feel loved and accepted here and have a great pride in their school. 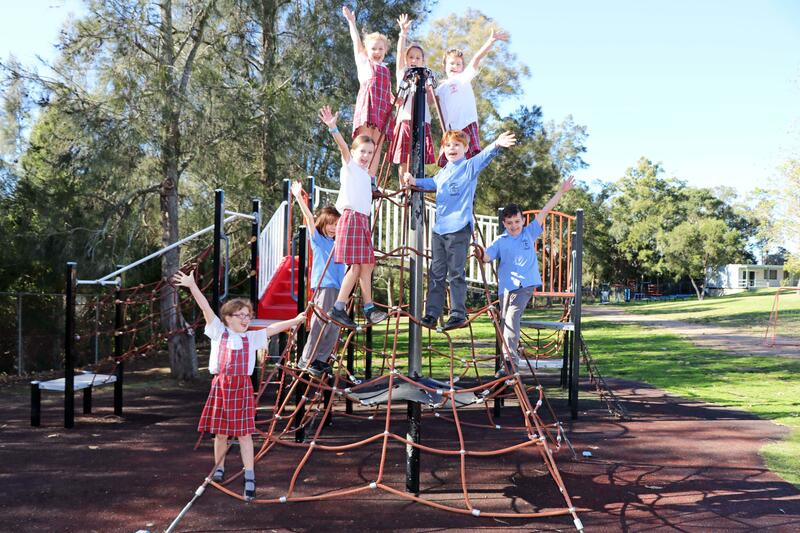 St Benedict’s operates as a Professional Learning Community where teachers work collaboratively with each other, with the students and with the parents to set student learning goals and deliver learning experiences tailored to individual needs. This allows all students to experience high levels of achievement and reach their agreed individual learning goals. St Benedict’s curriculum is designed to ensure students meet the NSW Education Standards Authority (NESA) requirements. The school is comprised of students and teachers with diverse experience, knowledge and expertise, who are actively engaged in learning together. Quality teaching is provided by exceptional educators at St Benedict’s. A highly structured combination of professional development opportunities and access to quality teaching resources and experiences has been developed to increase student readiness for, and engagement in, learning. Curriculum differentiation ensures that the needs of students are catered for at all levels. St Benedict’s learning support team provides learning support services within the regular classroom and special needs programs to students with disabilities and/or additional learning needs. The importance of respect and responsibility are two characteristics that everyone; staﬀ, students and parents are constantly reminded of, as they are integral to the school’s philosophy and purpose. They are both important aspects of the school’s manners sheet and statement of agreed practices. Respect and responsibility are fostered by an emphasis on respectful and responsible behaviour and by designating certain classes with the role of gardeners, “buddies” and rubbish monitoring and recycling. St Benedict’s is a very generous school community where students, parents and staﬀ are keenly aware of the needs of others. As such the school has a very active Mini Vinnies Conference that organises various fundraising activities in support of the work of the senior conference and parish initiatives, in both the local parish and overseas communities. The school also continues to develop close links with schools in Vietnam. St Benedict’s is very proud of the high participation in sport and the many sporting achievements gained by individual students and school teams. Sporting opportunities are quite extensive throughout the year. St. Benedict’s actively participates in school; Regional, Diocesan and Polding cross country, swimming and athletics carnivals. School carnivals are organised to allow for participation by all pupils, infants and primary. The school also encourages students to participate in Summer and Winter Sport Selection Trials in a wide variety of sports. These trials act as pathways to State Representation. School sport is held each Friday and the emphasis is on skill development, minor games, fun and participation. Teams represent the school in the Knights Rugby League Knockout, Regional Soccer Gala Day and The Maitland/Newcastle Diocesan Netball Gala Day. The Primary and Infant students are also involved in an 8-week intensive sporting skills program run by Sport in Schools Australia. The school is proud to participate in a weekly Macquarie Cup Soccer and Netball Competition held during Terms 2 and 3, competing against other schools, including Government, Independent and other Catholic schools in the area.